"Success is Standard for the Quality Control Queen"
Caroline Geoghegan was a busy child. By the time she left school, the Collinstown, Co Westmeath native had already cut her entrepreneurial teeth offering house cleaning services, a babysitting club and aerobics classes. It was no surprise that she opted to study business after finishing her leaving cert in 1997. 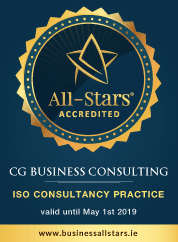 CG Business Consulting is a consultancy firm with a distinctive approach to working with companies of all nature and size to achieve and sustain ISO Certification in quality, risk and environmental management. "Quality management standard ISO 9001:2015"
The quality management standard ISO 900 was established 15 years ago to guide companies'approach to costumer service and performance improvement. The newest version of the standard ISO 9001:2015 si slated to launch in September.